This has a lot of ingredients but it is super easy to put together. Firstly poach your chicken breast, I throw them in a pot of water with soy sauce. I put them in from cold and time them for about 20 mins after boiling. I always cut to check and make sure it is cooked through. In a small bowl mix together mayonnaise, mirin, soy sauce, honey or syrup, pepper and combine. Once the chicken is cool you can shred it, I prefer to cut it up with chicken scissors. Add chicken to the bowl with the salad veg. 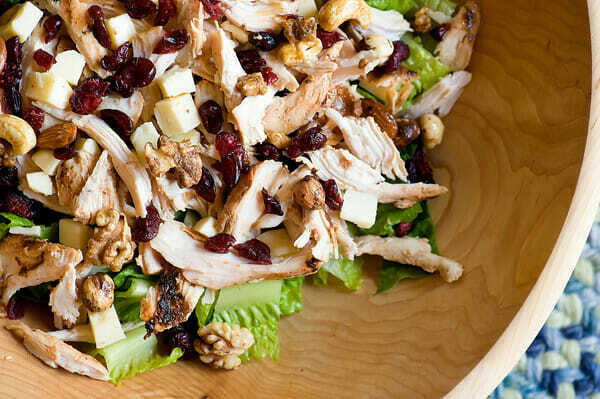 Top with crushed nuts, pepitas, and dried cranberries. Drizzle dressing over the top and toss salad, halfway through add-in avocado.